One of the delicious advantages of being old and tired is I can write whatever I want. I have no filter, editors, or advertisers, so I can declare with profound sincerity: Keep your damn dog off my dinner table. I recently attended a writing conference in Ohio. I spent money that could have gone for much-needed liposuction or parking tickets, but no, I paid for airfare, hotel, and conference registration because I won a humor writing award. It was all fun and games until the Eastern Princess appeared with her pampered pooch peeking pathetically from a padded, pink pouch. Readers of my blog posts know I am not a pet person. I grew up on a farm and animals stayed outside to guard the property, kill mice, and grow into beef steaks. No animals were in the house. Ever. 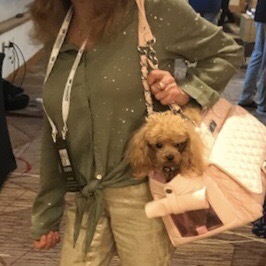 My essay “My Fish Won’t Hump Your Leg” was featured on The Huffington Post, and I was interviewed on “HuffPost Live from New York” to discuss the fact that not everyone wants to pet a poodle or slobber over helpless creatures stuffed inside expensive purses. I know these animals would rather be rolling in the grass licking themselves. In the hallway, it darted between my legs on a jewel-encrusted leash that had more bling than my bracelets. In the meetings, it rested in the owner’s lap and glared at me with distain. It resembled the love child of Chewbacca of “Star Wars” and a pouting chipmunk. I wanted to stick a handle on its shaggy back and mop the floor. The worse experience came at the formal banquet. Because the universe was mocking my evening of discontent, the Princess and her bag of barks sat across from me. “Of all the joints in all the in all the towns in all the world, she sits at my table,” I drawled in my best Humphrey Bogart accent. The caustic canine sneered at me. I ordered more wine and stabbed my roast beef. 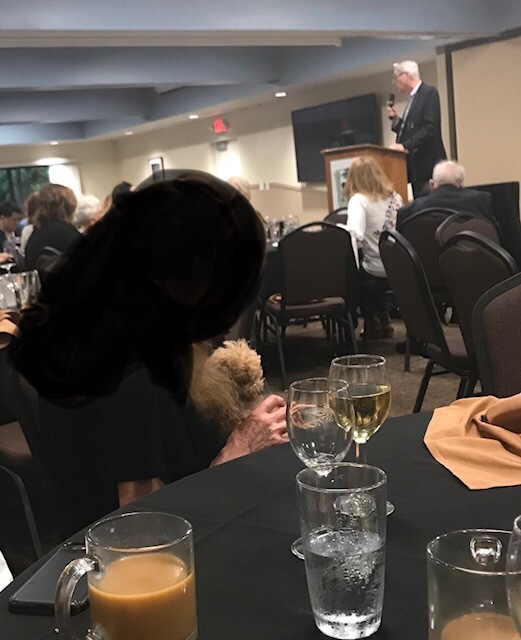 I really am a nice person, but when the owner began feeding the dog from her dinner plate, I coughed louder than normal. It was more like a heaving wretch. They shared the same spoon for ice cream, and they drank from the same water glass. The parched pup drank first, then the owner, then they repeated the unsanitary, disruptive scene. The vile vision made me sick as a dog and hounded me until I couldn’t eat. At least the experience served as a dietary aid. “This is a service animal,” she said, as if we should applaud and throw roses. I knew that wasn’t true. According to the government classifications of a service dog, it must be trained to perform duties the owner cannot do. It usually wears a vest, sits at the owner’s feet, and never eats from the dinner plate or shares a water glass with its owner during a formal banquet. It was a comfort dog and it was making me uncomfortable. What if more people started to bring armies of animals to professional conferences? I could save a lot of money by not attending. The next day, as I sashayed across the stage to accept my writing award, I glanced over to see my adoring fans. They all were huddled around the woman and her dog to take photographs and coo. The critter was making me bitter. “Doggone it,” I muttered, “You’ll never teach this old dog a new trick. I won’t pander to your prissy puppy.” Then I returned to my pet-free hotel room to pack for the flight home. My anxiety increased as I feared sitting next to a caged canine. I needed a comfort bottle. Caveat: I totally support the use of designated service dogs. They are well-trained and provide essential support for their owners.